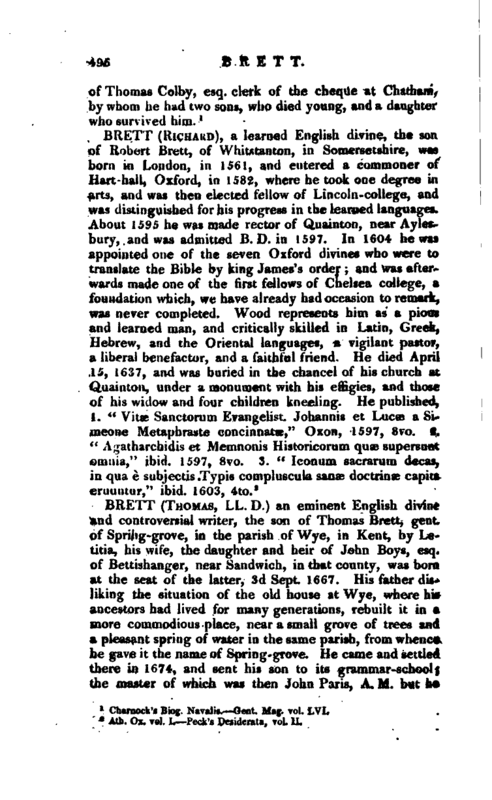 WORDS: BIOG: Brett, Thomas, Ll. D.
Mr. Pratt was afterwards preceptor to his royal highness the duke of Gloucester, and died dean of Rochester, in 1723.
under whose instruction the youth remained until 1684. Gery, however; died vicar of Islington, 1707.
the vicar, who was a tory, he became entirely of the same principles. Upon his father’s decease, at the earnest solicitation of his mother, he left Islington with some reluctance in May, 1696, came to his house at Spring-grove, and took upon him the cure of Great- Chart where he soon became acquainted with the family of sir Nicholas Toke, and married his youngest daughter Bridget before the expiration of that year. In the following year he took the degree of LL. D. as a member of Queen’s, and soon after entered upon the cure of Wye, as lying more conveniently for | him, but had no benefice of his own before April 12, 1703, when upon the death of his uncle, Thomas Boys, rector of Bettishanger, he was instituted to that rectory, on the presentation of Jeffery Boys, the eldest brother of Thomas. Archbishop Tenison made him an offer of the vicarage of Chistlet, of about 70l. per ann. soon after, and, as he acquainted him at the same time that he designed something better for him, indulged him in holding it by sequestration; and it was not long before he had an opportunity of making good his promise, by collating him to the rectory of Rucking, April 12, 1705. 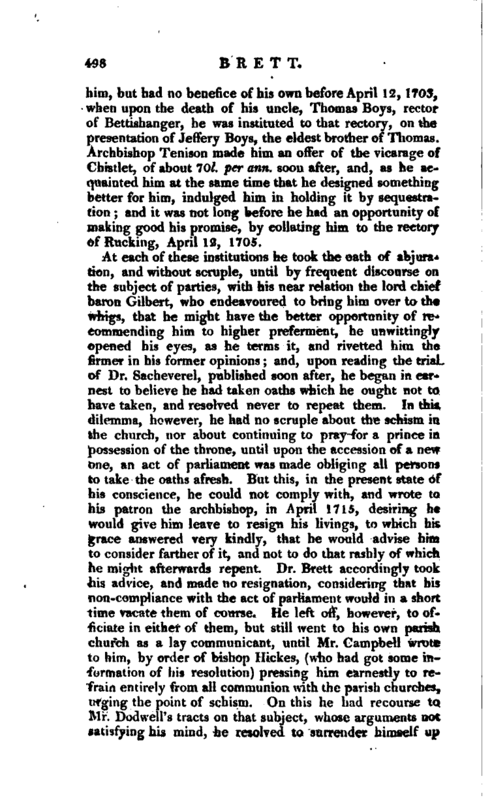 At each of these institutions he took the oath of abjuration, and without scruple, until by frequent discourse on the subject of parties, with his near relation the lord chief baron Gilbert, who endeavoured to bring him over to the whigs, that he might have the better opportunity of recommending him to higher preferment, he unwittingly opened his eyes, as he terms it, and rivetted him the firmer in his former opinions; and, upon reading the trial of Dr. Sacheverel, published soon after, he began in earnest to believe he had taken oaths which he ought not to have taken, and resolved never to repeat them. In this dilemma, however, he had no scruple about the schism in the church, nor about continuing to pray for a prince in possession of the throne, until upon the accession of a new one, an act of parliament was made obliging all persons to take the oaths afresh. But this, in the present state of his conscience, he could not comply with, and wrote to his patron the archbishop, in April 1715, desiring he would give him leave to resign his livings, to which his grace answered very kindly, that he would advise him to consider farther of it, and not to do that rashly of which he might afterwards repent. Dr. Brett accordingly took his advice, and made no resignation, considering that his non-compliance with the act of parliament would' in a short time vacate them of course. He left off, however, to officiate in either of them, but still went to his own parish church as a lay communicant, until Mr. Campbell wrote to him, by order of bishop Hickes, (who had got some information of his resolution) pressing him earnestly to refrain entirely from all communion with the parish churches, urging the point of schism. On this he had recourse to ?.lr. 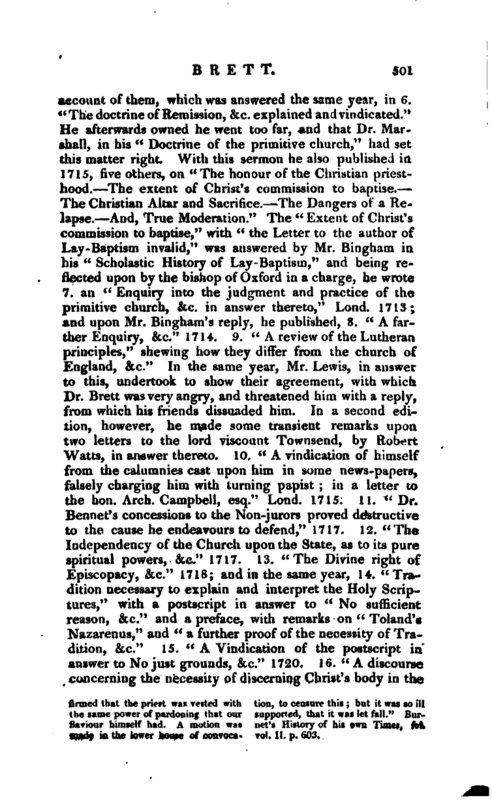 Dodwell’s tracts on that subject, whose arguments not satisfying his mind, he resolved to surrender himself up | to bishop Hickes, and upon a penitential confession, was received into his communion July 1, 1715, who from this time appears to have had a great influence over him. He now usually officiated in his own house every Sunday, where a few of the same persuasion assembled with his family, until he was presented at the assizes the year following, for keeping a conventicle, but the act of indemnity soon after cleared him from this. 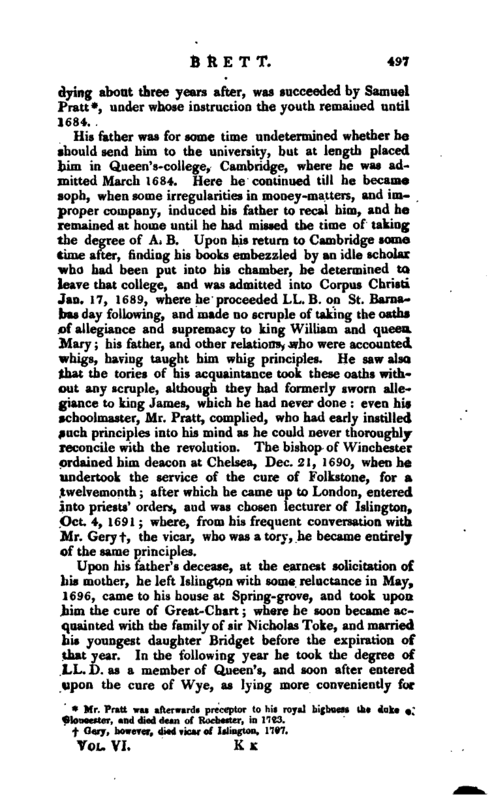 To avoid, however, any prosecution of the like sort for the future, it was thought adviseable to vary the place of their meeting, and he went accordingly, sometimes to Canterbury, and sometimes to Feversham, where part of his congregation lived, without any interruption, until upon intruding into the duties of the parochial minister of Feversham, by visiting a sick person of his communion, this minister complained of him to the archbishop in 1718, who sent him word that if he heard any more such complaints, he should be obliged to lay them before the king and council. He continued to officiate on Sundays, as usual, and no farther notice was taken of it, until in 1729 he obtained leave of Mr. Simpson, the minister of Norton, to perform the burial office in his church. 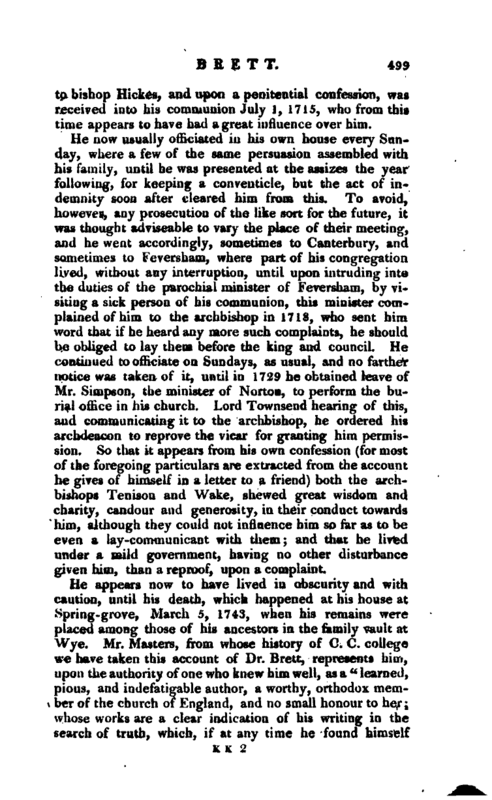 Lord Townsend hearing of this, and communicating it to the archbishop, he ordered his archdeacon to reprove the vicar for granting him permission. So that it appears from his own confession (for most of the foregoing particulars are extracted from the account he gives of/ himself in a letter to a friend) both the archbishops Tenison and Wake, shewed great wisdom and charity, candour and generosity, in their conduct towards him, although they could not influence him so far as to be even ^a lay-communicant with them; and that he lived under a mild government, having no other disturbance given him, than a reproof, upon a complaint. He appears now to have lived in obscurity and with caution, until his death, which happened at his house at Spring-grove, March 5, 1743, when his remains were placed among those of his ancestors in the family vault at Wye. Mr. Masters, from whose history of C. C. college we have taken this account of Dr. Brett, represents him, upon the authority of one who knew him well, as a “learned, pious, and indefatigable author, a worthy, orthodox member of the church of England, and no small honour to her; whose works are a clear indication of his writing in the search of truth, which, if at any time he found himself | deviating from, he always took the first opportunity of f<?­tracting it in, the most public manner. In private life he was a dutiful son, an affectionate husband, a kind parent, and a true friend. His conversation was ever facetious, good-natured, and easy, tempered with a becoming gravity, without moroseness, and so well adapted to those he happened to be in company with, that it rendered him agreeable to, as well as esteemed by persons of all ranks, who had the pleasure of his acquaintance.” His widow survived him some time, and one son, Nicholas, who was chaplain to sir Robert Cotton, of Steeple-Gedding, in Huntingdonshire, bart. and afterwards settled in Kent. firmed that the priest was vested with the same power of pardoning that our Saviour himself had. A motion was made in the lower house of convoca tion, to censure this but it was no ill supported, that it was let fall." 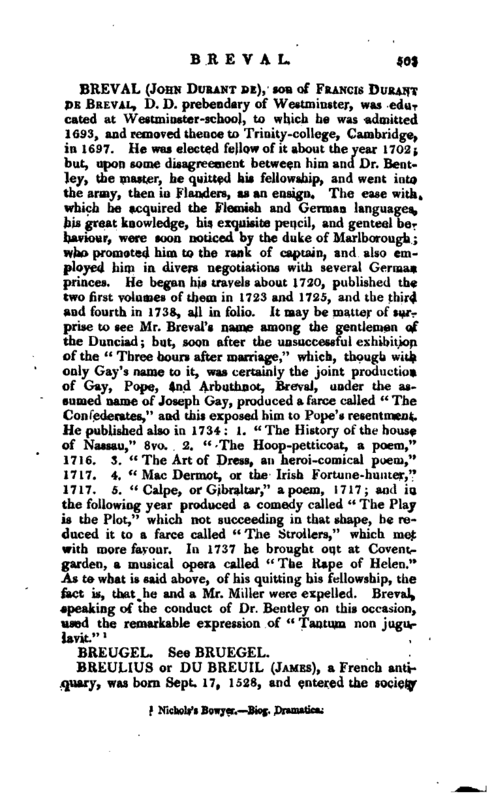 Burnet’s History of his own TImes, fol. vol. II. p. 603. See Biog. Brit. vol. VI. Suppl. 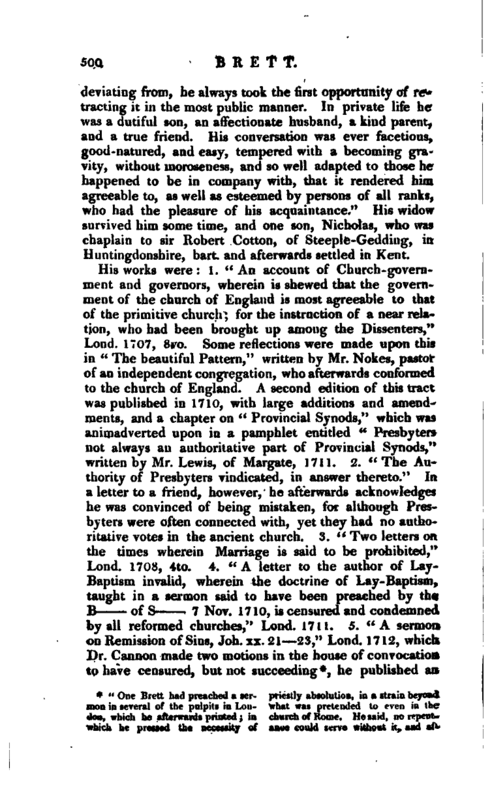 p. 114. note P.
prefixed to his posthumous tracts in 1748, with several prefaces to the works of others, particularly a very long one to Hart’s” Bulwark stormed,“&c. 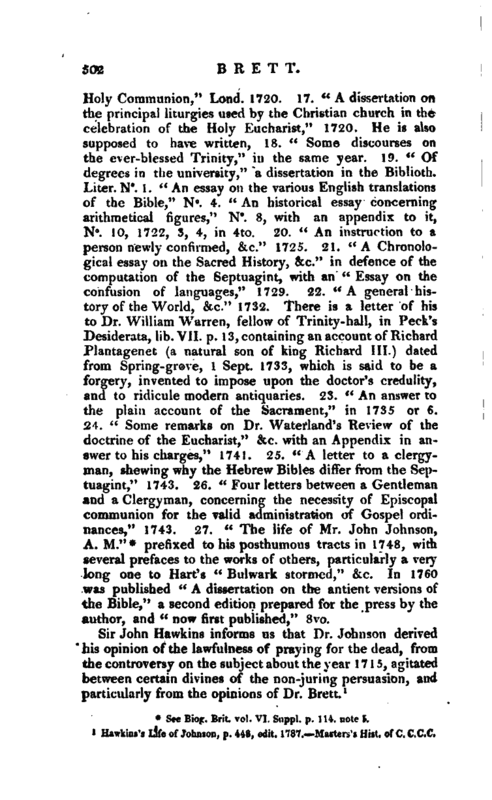 In 1760 was published” A dissertation on the antient versions of the Bible,“a second edition prepared for the press by the author, and” now first published," 8vo. Hawkins’s Life of Johnson, p. 448, edit. 1787. Masters’s Hist, of C. C.C.C.